By 2001, William was back in the United Kingdom and had enrolled at the University of St Andrews. News of this caused a temporary increase in the number of applications to St Andrews, mostly from young women who wanted an opportunity to meet him. The extra attention did not deter him; he embarked on a degree course in Art History, later changing his main subject to Geography, and earned a Scottish Master of Arts degree with upper second class honours. While at university, he represented the Scottish national universities water polo team at the Celtic Nations tournament in 2004. He was known as "Steve" by other students to avoid any journalists overhearing and realising his identity. ^ "William and Catherine set up royal wedding charity fund". China Daily. 16 March 2011. Retrieved 4 February 2012. The 2011 royal tour of Canada by Prince William, Duke of Cambridge, and Catherine, Duchess of Cambridge, took place between 30 June and 8 July 2011. The tour saw the newlywed couple visit all of Canada's regions. It was the first such tour undertaken by the Duke and Duchess since their marriage two months prior, and the first duties the couple carried out as members of the Canadian Royal Family. The tour was followed by more than 1,300 accredited media. It included the first use of the Duke of Cambridge's royal standard for Canada, the first Canadian citizenship ceremony attended by royalty, Canada Day ceremonies attended by approximately 800,000 people, and many smaller events across the country. Anmer Hall is a Georgian country house in the village of Anmer in Norfolk, England. It is about 12 miles (19 km) north east of King's Lynn, about 2 miles (3.2 km) east of the Queen's residence at Sandringham and about 2 miles (3.2 km) west of Houghton Hall. Anmer Hall was a wedding gift to the Duke and Duchess of Cambridge from the Queen.The current house was built in the 18th century and has formed part of the Sandringham estate since 1898. The house was registered as a Grade II* listed building in 1984 but was later de-listed. 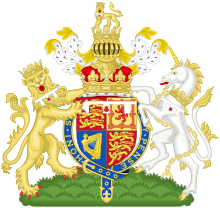 Baron Carrickfergus is a title in the Peerage of the United Kingdom, referring to Carrickfergus in County Antrim, Northern Ireland. Its current holder, since its creation on 29 April 2011, is Prince William, Duke of Cambridge, who was granted the title as a personal gift, by Queen Elizabeth II, on the day of his marriage to Catherine Middleton. On the same day he was also created Duke of Cambridge and Earl of Strathearn, with his bride becoming Her Royal Highness The Duchess of Cambridge as well as Countess of Strathearn and Baroness Carrickfergus as a result of the marriage. Traditionally, when male members of the British royal family marry, they are granted at least one peerage. Catherine uses the title Lady Carrickfergus in a fuller version of her titles and styles, Her Royal Highness The Duchess of Cambridge, Countess of Strathearn and Baroness of Carrickfergus. Duchess of Cambridge is the principal courtesy title held by the wife of the Duke of Cambridge. The title is legally gained upon marriage . Five of the eight Dukes of Cambridge did not marry, and thus there are only three Duchesses of Cambridge including the current Duchess, Catherine, wife of Prince William, Duke of Cambridge. The Flanders Fields Memorial Garden is a monument dedicated to the participants of World War I situated alongside the Guards Chapel at Wellington Barracks in Central London, England. The garden was opened by Queen Elizabeth II of the United Kingdom and King Philippe of the Belgians on 6 November 2014. Prince Philip, Duke of Edinburgh and Prince William, Duke of Cambridge were also in attendance, alongside soldiers of the Household Division. Kirchheimbolanden, the capital of Donnersbergkreis, is a town in Rhineland-Palatinate, south-western Germany. It is situated approximately 25 km west of Worms, and 30 km north-east of Kaiserslautern. The first part of the name, Kirchheim, dates back to 774. It became a town in 1368, and the Sponheim family improved its security with many towers and walls. William, Duke of Nassau, ancestor of the royal families of Belgium, Sweden, Denmark and Norway, and of the grand-ducal family of Luxembourg, was born in Kirchheimbolanden. It was also ruled by First French Empire between 1792 and 1814 before passing to Kingdom of Bavaria in 1815. It was a rural district centre in the Rheinkreis which was renamed Pfalz (Palatinate) in 1835. Princess Henriette of Nassau-Weilburg, an ancestor of both Prince William, Duke of Cambridge and his brother Prince Harry, was born in Kirchheimbolanden on 22 April 1780. This is a list of official overseas visits and Commonwealth tours made by the Duke of Cambridge. Prince William, as a child, first traveled with his parents on official visits and tours. Now he is one of the United Kingdom's most important ambassadors; sometimes the Duke travels overseas as a representative of the UK. The Duke also undertakes tours of Commonwealth realms, of which his paternal grandmother is the queen, as her representative or as a member of the realm's royal family. The following is the guest list for the wedding of Prince William and Catherine Middleton. The Prince William Cup was created in 2007 by the Welsh Rugby Union and celebrates 100 years of rugby union history between Wales and South Africa. It is named after the Vice Royal Patron of the WRU, Prince William, Duke of Cambridge, who presented the cup, at the inaugural match, held at the Millennium Stadium in Cardiff on 24 November 2007. The Royal William rose, registered under the cultivar name 'KORzaun', is a red hybrid tea rose. It was developed by Reimer Kordes from the cultivar 'Feuerzauber' (Kordes 1973) and is available under several other marketing names, such as Fragrant Charm, Duftzauber, La Magie du Parfum and Leonora Christine. According to The Ultimate Rose Book, the rose was introduced in 1983, the year of the birth of Prince William, second in the line of succession to the British throne. It has been planted in Savill Garden in Windsor Great Park in celebration of the wedding of Prince William and Catherine Middleton.The dark red flowers develop from even darker, pointed buds. They reach an average diameter of 13 centimetres (5.1 in) have a strong fragrance. The vigorous shrub has dark green foliage, reaches a height of 75–125 centimetres (30–49 in) at a width of 60–75 centimetres (24–30 in), is winter hardy up to −20 °C (−4 °F) (USDA zone 6b) and very disease resistant. Due to their long, solid stems, the roses are well suited as cut flowers. The Royal Foundation was set up in September 2009 to enable Prince William and Prince Harry (now Duke of Cambridge and Duke of Sussex respectively) to take forward their charitable ambitions. Catherine Middleton (now Duchess of Cambridge) and Meghan Markle (now Duchess of Sussex) later joined as patrons of the foundation. The wedding of Prince William and Catherine Middleton took place on 29 April 2011 at Westminster Abbey in London, United Kingdom. The groom, Prince William, is second in the line of succession to the British throne. The bride, Catherine Middleton, had been his girlfriend since 2003. The Dean of Westminster, John Hall, presided at the service; the Archbishop of Canterbury, Rowan Williams, conducted the marriage; Richard Chartres, the Bishop of London, preached the sermon; and a reading was given by the bride's brother, James. William's best man was his brother, Prince Harry, while the bride's sister, Pippa, was maid of honour. The ceremony was attended by the bride's and groom's families, as well as members of foreign royal dynasties, diplomats, and the couple's chosen personal guests. After the ceremony, the couple made the traditional appearance on the balcony of Buckingham Palace. As Prince William was not the heir apparent to the throne, the wedding was not a full state occasion and many details were left to the couple to decide, such as much of the guest list of about 1,900. Prince William and Kate Middleton met in 2001. Their engagement on 20 October 2010 was announced on 16 November 2010. The build-up to the wedding and the occasion itself attracted much media attention, being compared in many ways with the 1981 marriage of William's parents. The occasion was a public holiday in the United Kingdom and featured many ceremonial aspects, including use of the state carriages and roles for the Foot Guards and Household Cavalry. Events were held around the Commonwealth to mark the wedding; organisations and hotels held events across Canada, over 5,000 street parties were held throughout the United Kingdom, and one million people lined the route between Westminster Abbey and Buckingham Palace. The ceremony was viewed live by tens of millions more around the world, including 72 million live streams on YouTube. In the United Kingdom, television audiences peaked at 26.3 million viewers, with a total of 36.7 million watching part of the coverage.